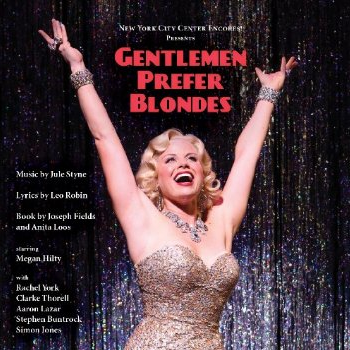 Carol Channing, Marilyn Monroe, KT Sullivan and now Megan Hilty, each one of them has given life to the colorful Lorelei Lee. I don’t know who’s the best, and there are others that I never listened to, but in terms of singing voice I dare to say that Hilty is the best. This new and fresh recording of Jule Styne and Leo Robin is a winner. From the terrific “Overture” to the “Finale Act 2” it seems everyone involved gives his or her best and the result is a highly enjoyable cast recording. There’s more music here than in all the previous recordings, with several instrumental numbers, plus two songs that I didn’t knew: “Coquette” and “Button Up With Esmond”. The cast is perfect. Hilty is completely at ease as Lorelei and sounds great. More than the famous “Diamonds Are a Girl's Best Friend”, I really enjoy her in the funny “It's Delightful Down In Chile”. But I prefer Rachel York’s Dorothy, who gives us strong and exciting renditions of “It's High Time” (one of my favorites songs from the score), “I Love What I'm Doing” and “Keeping Cool With Coolidge”. Aaron Lazar is a nice surprise, singing the beautiful ballads “Just a Kiss Apart” and “You Say You Care” with a very sweet voice. Also in the cast Phillip Attmore, Jared Grimes and Megan Sikora gave us a contagious “Mamie is Mimi”. No one writes scores like this one anymore and it’s a pleasure to hear it again on this delightful recording!